Gosh. I hadn’t put together a vegan cheese or snack platter of any kind for at least a year before I created the one pictured below just a couple of days ago! I think my obsession with these has now come back… and is certainly here to stay for a while. As a food blogger and generally creative being, most of my ideas tend to come straight from my own head. However, it is always fun to have a look through photos of other blogger’s creations or trending meals and foods, to see how others style them or add in their own twist. So, that’s exactly what I did recently to help me figure out how I wanted to style this cheese platter, and I thought I’d share my most up-to-date findings with all of you so you can get some ideas for yourself! I’d say you could now officially call me a professional cheese platter researcher… sounds pretty fun I think, haha. So, here are my favourite vegan cheese platters that I came across. You can click through on the images to head to the original post for each one if you’d like to spread the love to the owners! After showing you my favourites, I’ll be sharing a list of tips that summarises how to put together what (I think) is the most epic vegan cheese platter, plus how to make it extra visually appealing. … by The Healthy Hour. I also love this one by Ashley, also known as Blissful Basil, as it’s spread out more rather than all being on one board. This would definitely make it more suited to sharing with a larger group who maybe aren’t all sat at one table. I’m thinking dips and other platter features spread around multiple rooms… hell yes to that! 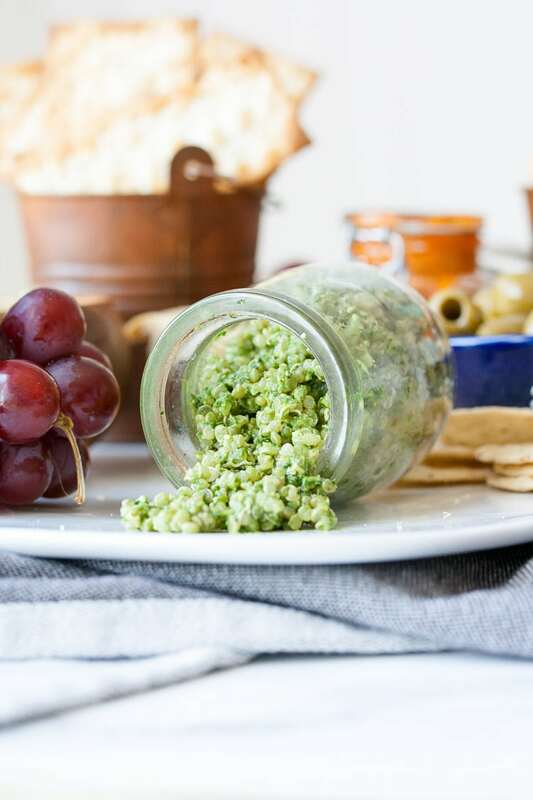 This next one by Sophia, or Veggies Don’t Bite (love that name, haha), is among my favourites because of the variety of crackers and because she shares the most delicious-sounding recipe for a pesto-quinoa dip to go with them. How awesome and creative does that sound?! Even better, the recipe for it is insanely simple. Check it out! … by Veggies Don’t Bite. ... by Veggies Don’t Bite. And last but not least, here’s one from a blogger that I’m sure most of you have heard of. This seriously delicious-looking board is by Minimalist Baker, and if you click through on the photo below you’ll get to the blog post which includes a recipe for Macadamia Cheese! Is your mouth watering? Mine definitely is. What did I take away from all of this cheese platter exploration? Everything listed below! 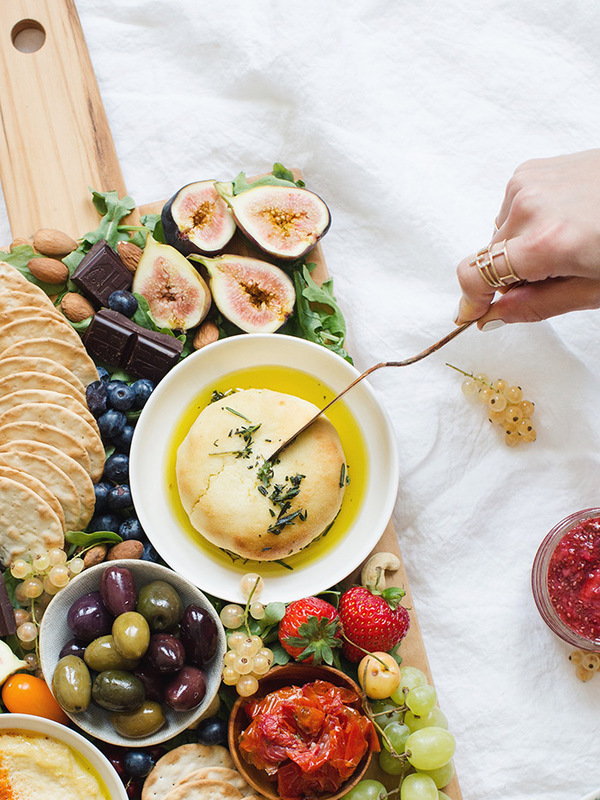 Here are my tips on how to create the greatest and most gorgeous vegan cheese platter. Have an equal mix of dips or sauces and things to dip in those sauces. For example, if you’re featuring cucumber sticks in the platter, you might also want to put a small bowl of hummus, guacamole or pesto in there too. 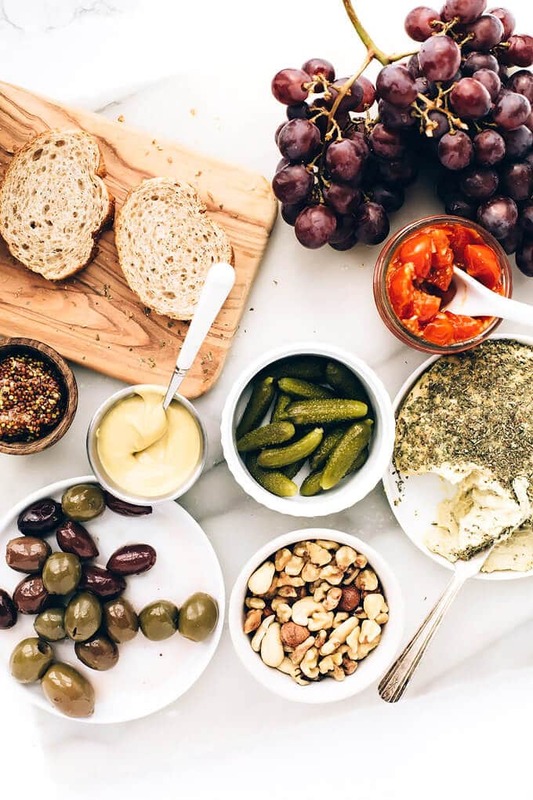 I love adding grapes to cheese platters, particularly darker grapes as the ones featured in my own board, which I shared right at the top of this blog post. This darker colour is great to contrast with the white or light-coloured cheeses. Carbs! Oh where would we be without you. I love using wholegrain crackers in my platters (what a great rhyme that was hahah), and sometimes like to use a variety of cracker shapes if I have quite a number of dips! I also quite like diagonally slicing a baguette. When it comes to the carbs, I always arrange them in one place on the board - for example I will always keep the cracker varieties placed separately rather than combining them all in one messy pile. I also attempt to artistically spread the crackers out in a curve or straight line. I was a strange child who loved olives at the age of three, and that love hasn’t gone away! I usually add in a small bowl of olives coated in olive oil, and sometimes use olives stuffed with red pepper or garlic, too. I personally love boards that are so covered in the featured foods that you can’t actually see the board. So to reach this level of insanity, my tip would be to fill gaps with rocket or other small green salad leaves, or with nuts like almonds and walnuts. Maybe if you have a cheese made from cashew nuts in the platter, you could keep that theme running by scattering a few cashew nuts in the gaps. I think it’s best to avoid symmetrical cheese platters - get creative and go with the flow! And lastly, time to consider how you’ll be eating this platter! I like to add a small jar or glass pot of cocktail sticks, as well as a cheese knife or two. In more detail, this is what I ended up putting in my own cheese platter: Camembert from New Roots, Ricotta from New Roots, black seedless grapes, olives coated in olive oil, pistachio pesto, almonds, wholegrain crackers and a glass of almond milk on the side, along with cocktail sticks and a cheese knife to serve. Next time I create one I’m thinking of incorporating some figs and cherries, perhaps some dried apricots, some sliced fresh bread (probably a baguette), a bowl of garlic-infused olive oil to dip the bread in, some more salad leaves, wholegrain mustard, definitely the pesto quinoa dip mentioned previously, and of course some hummus or guacamole. I love making sure that all of the colours go well together, so maybe I’ll make some different colour-themed boards… I’m thinking beetroot hummus for a pop of bright colour may have to be in there somewhere! But first I need to buy a board big enough for my cheese platter dreams, haha. Now it’s your turn. 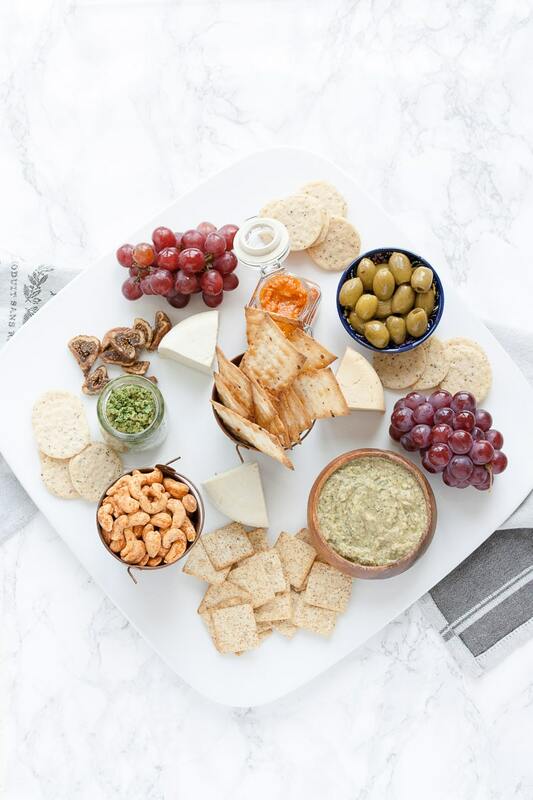 Let me know in the comments below what you’d put on your vegan cheese platter, or if there are any fun recipes you know of for dips and cheeses please send them over! I’d love to give them a try. Be sure to share your final artistic creations over on Instagram so I can give them some love and get some more inspiration for my next platters.